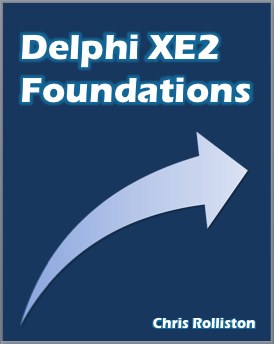 Since then (Feburary 2011) I have been writing a book entitled Delphi XE2 Foundations that documents the language and wider RTL, in a reference-and-conceptual-overview style. If you will humour me, I’ve been aiming for something like the Albahari brothers’ C# 4.0 in a Nutshell (which is a great book by the way), only without the curly brackets! Self-publish in three parts as eBooks on Amazon, i.e. through their Kindle bookstore. Amazon do free reader apps for a range of platforms, so potential purchasers won’t need an actual Kindle device. UK pricing will be £7.59 per eBook (£22.77 for the whole thing); international pricing will be similar given current exchange rates. If there’s interest, sell a printed version of the whole thing on Lulu or CreateSpace (probably Lulu – I have reservations about both, but CreateSpace’s American-centric payment system tips the balance). Why three parts in the first instance? For the reader it means you don’t have to buy the introductory stuff if you don’t need it, but to be frank, from my point of view Amazon’s royalty structure pushed me into it. For the same reason my pricing is going to be rather keener than I would have liked, not that potential purchasers will care! Having now basically written the thing, I need some help. Blog begging (blegging?) is possibly the lowest form of requesting something, but what the hell, if you don’t ask you don’t get! If anyone reading this has a Kindle Touch and would be able and willing to test a short sample for me, that would be great. In the US, Amazon’s recent software patch will need to have been applied – I understand the Touch originally did not have a landscape mode, which my book (or rather, the code snippets) require. I’ve been using Amazon’s Kindle Previewer tool and tested on a UK-spec physical Kindle, but haven’t been able to test on a Touch, given it has only just been released in Europe. I anyone would be willing to do a bit of gratis technical editing of a chapter, I will be very much grateful. A table of contents is here (link); perhaps not surprisingly, the multithreading chapter is the one that could most benefit from some double checking, though a second eye looking over any of the others would be helpful too. If you can help, please email delphifoundations AT gmail DOT com. If offering to look over a chapter, please tell me which one; if I won’t recognise your name and details from either the Delphi blogosphere, the Embarcadero forums, or having previously commented on this blog, please very briefly say a little about yourself as well. Frankly, if I get even one offer of help I will be pleased, but if in the event I get a group of people for the same chapter, I may have to choose between them. Have sent a email. Good luck! Thanks, and thanks to the others responders too. It will probably be tomorrow evening before I sort through the responses (I’m currently in a hotel typing on a netbook…), so if anyone else wants to reply, please do. Interested in the books in paperform. I won’t buy an ebook with DRM or in a proprietary format, but I would cheerfully pay for a PDF and very likely the printed edition as well. I have someone interested in learning Delphi, and this book looks like it might be useful. Part 3 looks interesting and fresh. Looking forward to read it. Would love to buy the paper version. Same as Bruce. The book(s) in PDF will be great. And depending on the price a printed version will be bought also. The eBook version is of no use, so I hope you will also add a PDF and/or print version to choose from. I would be more interested in a paper book, with a very comprehensive index. If I had to settle for an electronic format, it would have to be searchable. I’m not keen on DRM either. PDF and ePUB seem to be the formats of choice, PDF for precise layout control and ePUB for flexible layouts for different screen sizes. I believe ePUB is a subset of HTML & CSS all zipped up. I’ve made a couple of videos (get them from LearnDelphi.tv) which can be purchased through shareit.com, which I chose as they do the content delivery (handy when my videos are close to a gigabyte combined). Yes, and Amazon’s (newest) format is just a slight variation on ePub. I started out trying a straight conversion from Word, and found against expectation that it was… actually alright. Not perfect obviously, so several evenings later I had about 200 lines of handcrafted VBA (plus one small helper object written in Delphi) to manually convert from RTF/DOC to Kindle-friendly XHMTL, like you do! I am fine with Amazon eBook format. Bring it! It has nice features, accessible from many devices, and notes and highlights stored in the Amazon cloud. Thanks! Hi It would be great if you setup a mailing list to be notified when your book arrives. You could do so using mailchimp.com even for free. Thanks I can´t wait to purchase it for our employees. Sounds like a really good thing. My personal preference would be for paper hardcopy, from Lulu or equivalent. I have a Kindle (with keyboard, the small one), and technical books, particularly with illustrations and/or source code, are just easier to read with paper than the little Kindle. I guess maybe reading it on Windows with the Kindle reader might work better. At any rate, I’m looking forward to it. a printed copy would be great I guess for a few people around here who revisit or visit Delphi now. At the end of the book you could insert a automatic index then. Once the ebook version is out, I’ll look at what Word’s auto-indexer does, yes. I’m not going to manually mark out key words in a 500+ page book though, or at least, if I do that, it will be for a ‘conceptual index’ or the like. I am interested in the book when it is out for sale. I would buy right now a printed version of your book. No matter the price. Good luck. Thanks. CreateSpace (Amazon’s POD subsidiary) have just made themselves more attractive to a Europe-based indie, so… maybe. I’d like to help, but don’t agree with DRM. Have sent separate Email.